What happens when your “Dream Job” becomes reality? We interview Institute Graduate Rebecca Lillywhite about the new job and new possibilities. Meet INstitute Graduate Rebecca Lillywhite. 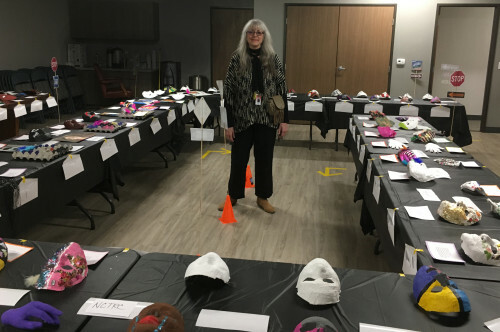 She just presented a show of 50+ masks made by her clients at the McAlister Institute. Some of the masks were plaster ones made on the face; some were made from palm fronds, and a few mixed media masks, paper, egg cartons and found objects. They were accompanied by small stories from the artists who made them. Those attending the show were encouraged to leave responses on little slips of paper next to the masks. When I went there was a line to get into the room filled with these images, which were displayed dramatically on tables covered with black cloth and street signs telling you which way to turn. Masks speak to identity revealed and concealed, and to the power of the arts to transform. For 40 years the McAlister Institute has offered recovery services to men, women and adolescents suffering from alcoholism and drug addiction. They had a wide variety of services, but not Expressive Arts Therapy until June 2016: That’s when Rebecca went looking for a place to finish her internship hours. Once her foot was in the door she impressed them with her skills and perspective as an expressive arts therapist. After working with a few groups, they asked her to spread the Expressive Arts work to all 25 locations. Rebecca was thrilled, but somewhat overwhelmed with the sheer volume of the work. Clearly, she needed an intern. Enter Linda Whitney. Together they have expressive arts groups helping a broad cross-section of clients from teenage boys right out of juvenile hall to older men, women who have lost their children. 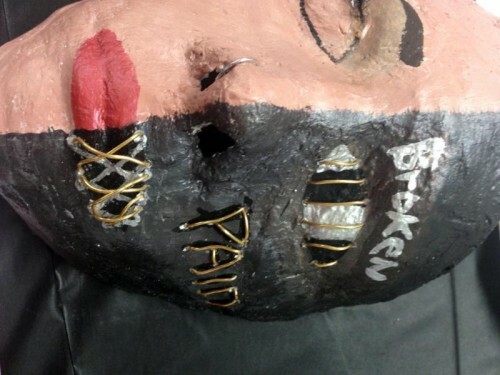 The mask project, is only one of the many interventions through the arts that are employed at McAlister. Given the interest in the program, McAlister Institute leadership have mandated expressive arts therapy in all of their programs. Beyond the pain, and the hard work of recovery, lies hope and beauty. The arts help with imagining the path. Rebecca calls this her Dream Job. Working in the arts, and helping others find their way is what makes her feel fulfilled and like a part of the solution. Helping in Expressive Arts suits her perfectly, keeping her in touch with her own creative spirit. Rebecca works in five art disciplines and together with her interns serves about 400 people per month. Her career was not always so satisfying. Rebecca came to the Institute after years of working in social work supervision jobs for the Navy, that, as she put it “…drained the life out of me”. When she found the Expressive Arts Institute she said, I found my tribe. This is what I have been looking for. Rebecca came to us as a mature therapist, with her LCSW degree and license. But it was the Professional Diploma in Expressive Arts Therapy that opened the door to her imagination, unleashed her artistic spirit, and breathed new life into her career, with a job she calls. “… the crowning glory of my career, my dream job and what I was born to do.” Congratulations to Rebecca, and to the McAlister Institute for their use of the Expressive Arts to heal and fulfill. What about your dream job? This entry was posted in Celebrations, Graduates, in the workplace, Uncategorized by Wes. Bookmark the permalink.